Sweetened with apples and dates, this spiced allergy-friendly carrot cake is dairy-free, egg-free, and gluten-free! To dress it up just a bit, our dairy-free Vanilla Frosting or Vanilla Cream Cheese Frosting are delicious drizzled on top. 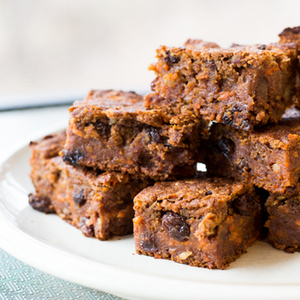 Sweetened with apples and dates, this spiced carrot cake is allergy-friendly too. Dairy-free, egg-free, and gluten-free! Then, in large mixing bowl, whisk together flax seed meal (or chia seed meal) and 1/4 cup plus 2 tablespoons of water. Let sit for 5 minutes to get gummy. Meanwhile, blend dates and 1/2 cup water together in blender or food processor until smooth. Then add to mixing bowl. If using whole apple instead of applesauce, wash, quarter and deseed apple (no need to peel). Chop until very fine in food processor. Then add apples or applesauce, oil, vanilla, cinnamon, allspice and nutmeg to mixing bowl. Add salt, baking soda, baking powder, and flour(s) to mixing bowl. Add carrots, raisins and nuts. Transfer to prepared baking pan(s). Then bake for 45 minutes, when it should have taken on a deep brown color. Lightly cover the pans with foil and bake for an additional 15 minutes. A toothpick inserted will come out clean before it is really done, so use deep browning as an indicator that the cake is almost done. Then transfer pan(s) to cooling rack. Finally, store uneaten portions in a covered container in the refrigerator. This is delicious on the 2nd day, reheated in a toaster oven! *To make chia seed meal, blend 2 cups of chia seeds in a dry, high-powered blender on medium speed for 10 seconds. Measure after blending. *The bars can be gluten-free if you use buckwheat and sorghum flours. However, I have not worked out the soaking and/or sprouting of these gluten-free grains. Do you love carrot cake, too? 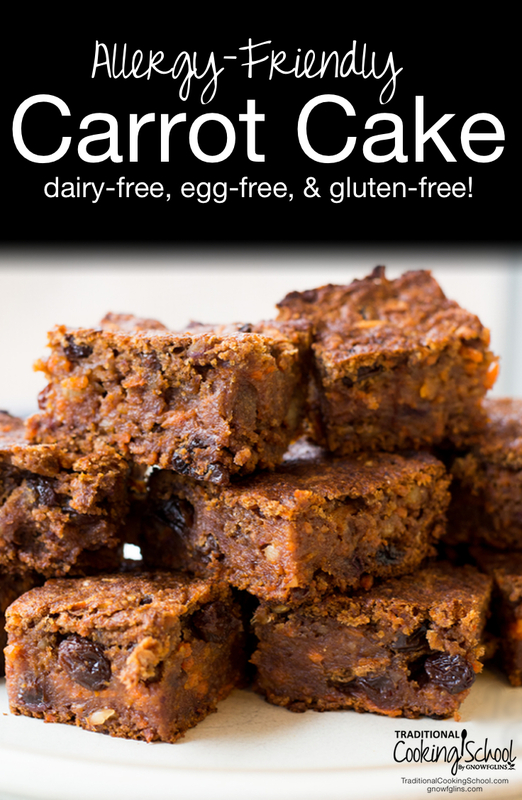 Have you ever made an allergy-friendly carrot cake? Thanks, Mona! I’m glad you like the soap and that it arrived safely. I will let you know when the check gets here. 😀 God bless you today! this looks great. I’ll definitely try it. Oh, good! Please let me know how you like it! Hey Wardee! It’s been a while, but I was thinking of you because I want to buy a serger, and I remembered that you bought one fairly recently. How do you like it? Would you mind terribly if I asked what exact model you have, and what you like about it, and if there are any things you really don’t like? I know this has nothing to do with your carrot cake, but I couldn’t find your email address. Hi, Sarah! Yes, I did buy a serger back in January. I love it. It makes such a difference in all sewing. Here is my review of the machine: Janome 1110DX. I am very happy with it and there is nothing I don’t like about it. About the cake, though, it sounds great. I need to make a real effort to get back to less-refined eating. We just moved cross-country, and in the process of searching for a house, I’ve started relying on a lot of pre-made stuff. At least there is some good stuff at TJ’s (which is now 5 minutes away! ), but I still need to get back into whole foods. Anyway, whenever my mom has no applesauce for something, she gets a fresh apple, peels and chops it coarsely, and puts it in the microwave for a minute or so. Then you can mash it without having to get the whole food processor dirty. You’ve made a big move and it is always difficult to maintain the same healthy habits during that kind of transition. Thanks for the tip about the quick applesauce in the microwave. While I do appreciate your mentioning it, I don’t recommend using a microwave for any cooking. We made a choice several years ago not to use a microwave because of believing that the microwave damages the food through its unnatural cooking process. Sometimes I miss the convenience. 😉 But I believe we’re better off without it. Thanks for visiting, Sarah! I am happy to see you again. Congratulations on the move. I love carrot cake! I love the idea, but can’t seem to get my husband to eat anything with dates in it. I wonder if something else may sub well? Hello, Alisa. The date flavor isn’t strong, in spite of there being 1-1/2 cups in the cake. Does he object to any dates at all or only if he can see them? Cuz they can’t be seen here and barely tasted. But… I’m thinking you could use other dried fruits, like pears, figs or apricots. The idea is to use sweet dried fruit blended with water as the sweetener. Give it a try! I’d love to hear how it turns out. This is for Alisa, may I suggest using raw honey in place of dates? I use raw honey in all of my baking and it turns out great. Oh, yes, raw honey could be used. Thanks for mentioning that. I was trying to keep it fruit-sweetened, but natural sweeteners would work, too. I would start with 1/2 cup and perhaps increase to 3/4 cup, depending on a taste test. The flour might have to be reduced to account for less liquid. It is worth a try! a) Finally, a carrot cake that has more carrot in it than flour, not to mention sugar! b) Wardee should really write a book. Thanks so much for sharing the fruit (carrot?) of your labours so generously. I am just thrilled that you like it so much! It means alot to hear that someone else enjoys the same food we do. Thanks for letting me know and for the very kind compliments. We made your carrot cake this week and it is incredible! Since it was a special birthday celebration we also made up a frosting to serve on the side (cream cheese, butter, the juice and rind of a fresh orange, and agave or honey to sweeten)…everyone loved the cake. I had doubled the recipe and had enough to make a loaf as well. In the loaf I added unsweetened coconut shreds – although I liked the flavor, it changed the texture in an unpleasant way (there was a sense of the carrots having not cooked all the way through – even though it was the coconut texture). I so appreciate this being fruit sweetened and gluten/dairy and egg free! Gods love and blessings be with you and your family! Hi, Cammie! I am thrilled to hear that you and your family enjoyed the carrot cake, the sloppy joe’s and the quinoa dinner cakes. That’s interesting about the coconut. I was thinking of adding some next time I make the cake, but I don’t think I will now. God bless you and your family. Thanks for visiting! A quick question about your carrot cake. Do you use regular buckwheat flour? When I have used it in the past for breads it seems to have a very strong flavor. I have heard there is a “white” buckwheat flour but I cannot find it anywhere. Just curious as I plan to use your recipe for the holidays for the individuals in my family with food allergies. 2) Otherwise, search on the internet and see if you can order some of the “white” buckwheat flour. But to make this cake, consider using all sorghum flour or leave it as is. I don’t think the buckwheat flour flavor will be overpowering. That does sound yummy! What an interesting recipe. You’re very adventurous! I do not know the exact substitution for self-rising flour, but I think it has to do with adding leavening such as baking powder to the flour. Hope you enjoy the carrot cake! Wardee – this looks great and I can’t wait to try it. I don’t do well with lots of buckwheat in a recipe so I’m going to try some alternative flours like almond meal and millet mixed with the sorghum. I’ll keep you posted. Thanks! Ellen – I hope you enjoy them! Do keep me posted! So delighted to have found another Christian lady so willing to share the info that God has given! May the Lord richly bless your family!! Thanks so much. Hi, Michelle! It is good to “meet” you! I hope you’ll visit again! I am going to admit my ignorance. For the Sprouted Spelt Flour, I am wondering, how you do this. I would think that you sprout the spelt flour, then dry it, then grind to make a flour, is this how it is done?? .-= Terri´s last blog post… Jonathan Update 6/27/09 =-. Can I use whole wheat flour as a substitute for the spelt? If so, would it be the same amount? MarLou – I always use more spelt than I would whole wheat, about 1/8 cup more per cup, give or take. So start with less than 1-1/2 cups of whole wheat, and be prepared to add more if you need it. It will be a “wet” dough anyway, so don’t try to get it dry. But I think that should be right. Let me know how it goes! I made this for my 7 year-old’s birthday this weekend, and it passed the father-in-law/brother-in-law/husband test with flying colors. My kids all loved it, of course…it’s the grown-ups in my life that are sometimes resistant to change! 🙂 THANK YOU, Wardee! Where have you been all of my life??! I do a vegan, natural, no sugar diet for health reasons. And its so hard to find a recipe that encompasses each and every dietary restriction that I have! I love this and will be looking for more!! This does look yummy! Do you think I could use more raisins instead of the dates? I don’t currently have dates, but I do have a ton of raisins. Also, since I’m not avoiding eggs, would I be able to use one egg instead of the flax seed? Could I make this with sprouted whole wheat flour? I know it would not be gluten free then. But with sprouted grains, I am ok with wheat. PLEASE, PLEASE!!! DO (b) NOT(/b) SPROUT SORGHUM!!! IT IS TOXIC!!!! Looks delish! My understanding is that there is gluten in baking powder. Do you know this to be fact? Have you tried freezing any leftovers? Also is it possible to reduce the amount of dates without affecting the recipe? Yes, you can freeze any leftovers. We have not tried reducing the number of dates. It may be possible to reduce them. They give moisture and texture so you may get a drier mixture which may affect baking time so maybe bake it less.